If you need to charge your lipo cheaply or get a low cell back up to par, you couldn't do any better than getting a TP4056 charging board. Look online, they are so cheap. Charging is at 1 amp and the battery is charged through the balanced lead only; one cell at a time. For around £2.50 UK, I have four chargers so can charge four batteries simultaneously. If you have a low cell off your balanced charger, pick up the low cell using one of these. To be cheaper still, I use an old computer power supply to provide the 5 volt supply. I have just timed the cell charge time. Battery = 3s 2200mah. Single cell charge time = 2 hours and for all 3 cells = 6 hours. Perhaps considered a long time by some, but, a small penalty for a charger that's very cheap! ##### Please note..... Do not cross connect the battery to the charger board, you'll fry the chip instantly, even on a depleted battery!!!! You have been warned. I've noticed these boards before but haven't' ordered any yet - I was wondering how isolated the outputs are and if you could make a 2S charger but connecting two in series (or 3 for a 3S) - that depends if they use a common ground (or positive) really - i suspect they do unfortunately which would end up shorting out a cell. at some point i'll order some and test it - i've noticed on ebay \ BG there are USB powered 2S chargers but have never found a 3S one ! Unfortunately you cannot charge cells simultaneously. I use a 2 pin plug and work my way up the balanced lead! Remember as well that the + and - terminals are common connections serving as the positive connection to one cell and negative the other! The (+ - ) connection is the centre wire on a 2s - you cannot connect with + and - simultaneously on this wire!!!!! Just a word of warning: Check your balance port voltages using an inexpensive multimeter. You'll find that the power output pins (the ones other than ground) are all basically outputs at different points of the series connection. That device looks like it's rated to charge a 1S cell, so really, to properly charge each cell of a multi-cell, connected in series pack, you'll need to pull the shrink wrap off and connect the charger directly to each cells +/- tabs. To be super safe, you would want to disconnect the other cells from each other, so that would make it really impractical. Basically, I think trying to charge a series connected battery with this device will put you at high risk for a really unbalanced battery. Considering how inexpensive lipo chargers have become, and how much time and effort you would save using them, I'm not sure why one would go about DIYing a charger this way. Makattack is correct. This device is a 1s charger. For multiple cell batteries you charge each independent cell via the balance lead in turn. That said, it slow but a really cheap way to charge a lipo. At a max charge rate of 1 amp, it can be really, really slow. The point is how cheap can you make a lipo charger. If you are on a limited budget, its an option, which was the point of the thread. What is nice about this board is that it has a great charging curve that's very well suited to lipos. I was thinking along the lines of 3 separate boards to charge the 3 cells - you wouldn't need to separate the cells to charge them as long as each circuit is isolated from each other e.g. no common ground or 5 v rail - that depends on the circuit of the boards and how the chip works. But i agree - don't mess with batteries - they get upset easily - i don't trust cheap Chinese mains powered devices - mix that with batteries and i'd rather not be near ! oh and these guys look like they are trying it - i'll let them try it and watch ! Cut your losses and as I have said, charge 1 cell at a time working up the balanced lead as each cell becomes charged. With 3 charger boards, you can charge 3 batteries at the same time - one cell at as time!!! There seems to be a misunderstanding about the balance plug connections on a Lipo. The wires are arranged so that between each pair of adjacent wires in the plug is a single cell. 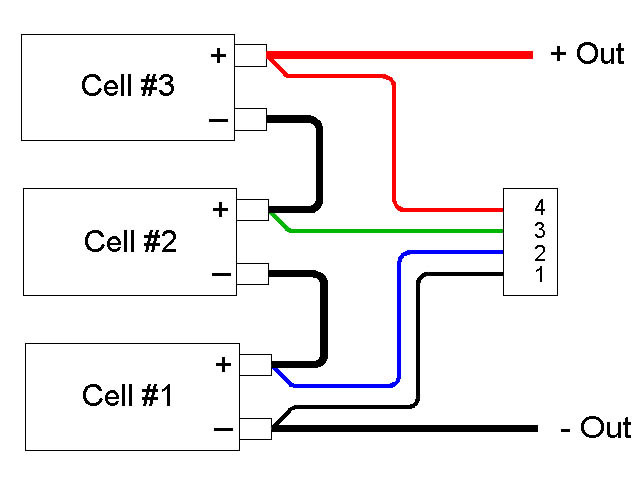 therefore each pair of adjacent wires can be used to charge a single cell. To charge 2 cells at the same time using single cell chargers all you require is 2 separate single cell chargers whose power supplies have NO COMMON REFERENCE, and for three cells you would require 3 chargers WITH NO COMMON REFERENCE, and so on. A simple multimeter could quickly establish if the power sources have common references. If in doubt you could resort to separate lead acid batteries each with its own 5 volt regulator to drive each of the chargers listed above. Just make sure that you do not cross connect the batteries and all will be fine. Err, no, I believe the misconception is exactly what you state, that the balance plug of a multi-cell battery pack allows you to charge each individual cell independently. A quick and simple check with a multimeter will show you that is NOT the case. Think of it this way, there's only one ground wire on the balance plug. Is it a common ground? If it is, wouldn't that make that pack a PARALLEL pack and not a SERIES pack? So, if you want to individually charge each cell of a 3S pack, you would need a very specially wired pack where you have a ground wire between each cell exposed. You would connect the charging/output of the single cell charger to the first power output of the balance plug (the one next to the ground). The third one would be left alone. Most parallel chargers charge via the main battery terminals (the full pack voltage has to be configured as the # of cells usually) and use the balance port to detect / read voltages for each lead and displays individual cell voltages by using calculations to split the voltages up. When you're balance charging, the balance port is used to discharge the cells, but as you can see, you really can only discharge one of the cells individually and the others get discharged as a series bank unless you're talking about a 2S pack. Your simple lipo checker does the same, but note that those are only estimates. Basically, trying to charge via the balance port requires creating a bit of a Rube-Goldberg contraption unless you use the end-most pins and are just charging the full pack in series... but then, you might as well just use the battery terminals. Of course, you're not balance charging, but nor would you really be doing that if you used a simple module set to charge anything other than the 1S side of a multi-cell series pack. Being trained in and working in electronics and communications for well over 40 years I can say that I am correct. Ground is just a point of reference. My argument above was to not use a common point of reference. Try measuring between each adjacent pair of wires, (Just as a battery monitor does), and you will find that you are directly measuring the single cell voltage, regardless of which pair of adjacent wires you select to measure. 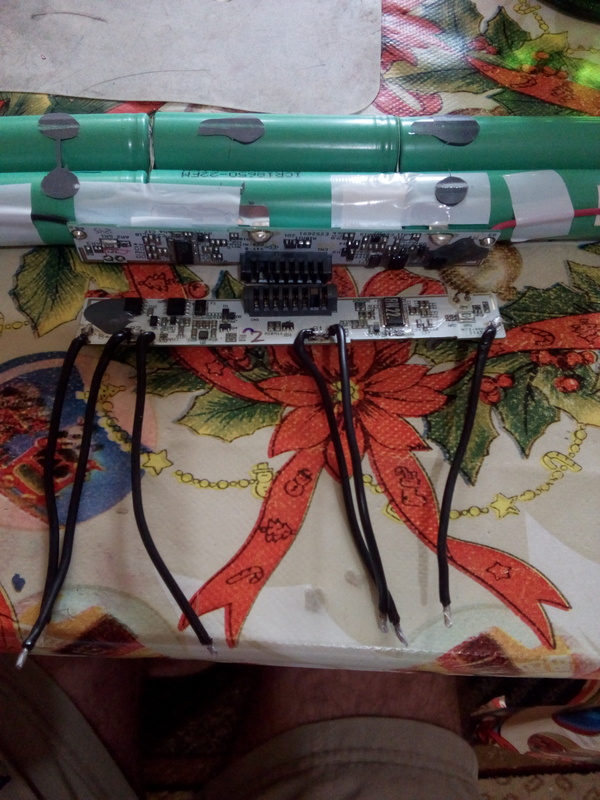 Another thing to think about is if I was to make the centre wire of a 2 cell pack the GROUND, (Reference point) then the battery pack would supply -3.7 volts and +3.7 volts. Still a total of 7.4 volts of course. My previous post was just a method of using multiple single cell chargers to charge a multicell pack. using a system where each charger has its own point of reference and there is no common reference between them. This would charge each cell independently to full terminal battery voltage. The cell format is as said, SERIES! ( - cell 1 + )( - cell 2 +)( - cell 3 + ) etc. So as you can see the connections between cell 2 and (cell 1, cell 3) have a + connection on one cell and - on the other. It is simple to connect a charger board with 2 pins which connect (in turn) to each cell. Charge cell 1, charge cell 2 and finally cell 3. Again, it is not an quick way to charge a battery. Just charge as for 1s, one cell at a time. It will be 1. Safe & 2. Cheap! I encourage innovation, development and debate but my original post was aimed at being simplistic and above all cheap. Please feel free to continue debate and develop. Oops! I stand corrected. That's right. I want even thinking about connecting the adjacent wires such that you're connecting across each cell. True enough, that will work but you just have to be very careful not to use the pack cathode and just move the anode connector around. Heh,this is why a software guy dabbling in hardware is so wrong. I just made the assumption people were connecting these boards to the first cathode in the series. Of course I find it also odd that electrons are negatively charged, yet all circuits show flow from positive to negative. I, as an ex-engineer believe in the KISS (keep it simple stupid) approach to everything. Should anyone better than me and be able to connect these circuits simultaneously, please let us know. In the mean time, avid readers of this thread should carry on with the KISS approach. Charge each cell in turn and one at a time! If anyone knows a way of connecting these simultaneously, please let us know. Best 73,s for now Makattack.